Microblogging in English or Chinese continues to present limits on and challenges for academics who ‘watch’ Northeast Asia. Certainly, in the process of gathering information about the region, it has gotten rather easy to share pithy viewpoints, but the problem of why one is sharing a given piece of information is not always self-evident. Personal blogs seem to be a good medium through which a slightly more considered and extended discussion can unfold. In the following post, I take a look at five stories from the Chinese news media which all deal with North Korea in some way, at a level of depth that hopefully resides in the space between ‘off the cuff’ (which is a fancy way of saying ‘spastic’) tweeting and the more austere, rigorous, and lugubriously-edited mode of writing that necessarily prevails for more heavy-duty academic writing. 丹东一民警制毒获死刑 家藏冰毒40斤 | In Dandong, a former policeman has been handed death sentence for meth manufacturing with two accomplices, on Chinese territory. No North Korean link is mentioned in this story (does there need to be one? ), but the story does suggest that pathways for drugs into the Chinese interior from Dandong are well-honed and the profits high. As with so many law-and-order stories from the border region in the past couple of years, the outlet able to cover the story at length is Xinjinbao (新京报), which is strangely rendered as ‘Beijing Daily’ in English. A severely abbreviated version of the story was carried on 18 June in English by the erstwhile Global Times, whose editor was, at the time of publication, waxing metaphorical on a stage in Beijing with a handful of former and current diplomats about the PRC’s new Silk Road into Central Asia. A former policeman in Dandong city in northeast China’s Liaoning Province was sentenced to death for producing drugs with a habitual criminal, a court announced on Thursday.According to the Intermediate People’s Court of Dandong city, Wang Changping, a former policeman, began producing methamphetamine at the end of 2012 together with Han Xuedong, a drug producer who was released from prison in June 2011. The group built three meth labs in rural areas of Dandong city and Tongliao city in the north Inner Mongolia Autonomous Region, and produced more than one hundred kilograms of methamphetamine in one and half years. They were busted in May 2014, with 20 kilograms of drugs seized at Wang’s office and apartment. The court sentenced Wang and Han to death. Another two suspects in the case were sentenced to death with two year reprieve and imprisonment for life respectively. 山东青岛－辽宁丹东开通跨海汽车：行程很奇特 | A new means of traveling for cheap between two of China’s most interesting northern port cities — Qingdao and Dandong — has now opened up. 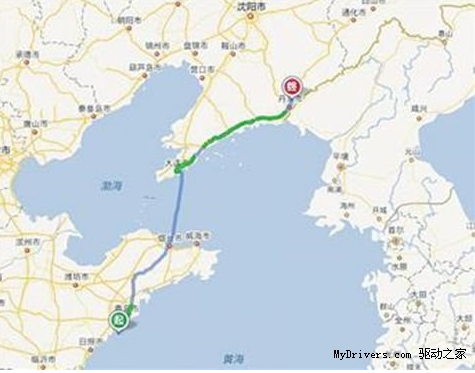 A bus line links the two cities by means of ferry travel through the Bohai Gulf, via Dalian saving the need to drive through the giant Beijing-Tianjin choke point. (Like a prospective conquerer of China in the seventeenth century, the shrewd traveller should to pay heed to the difficulties of traversing the Shanhaiguan.) There was once discussion of a sea tunnel being built between Shandong and Liaodong peninsulas, but in the meantime, this will do nicely, thank you. A rather middle-ground approach is outlined whereby the World Food Program projected shortages in the country are discussed, and the need to de-politicize food aid to North Korea. There is also some effort put into stating that North Korean ‘transparency’ is better than it used to be — while at the same time saying absolutely nothing about how much food aid China should give, what type of grain, or how much has been given in previous lean years. But then again, it’s just an op-ed indicated to gently assure that the Chinese public is on-side with any aid renderd, and Li Dunqiu does not appear to have a Nolandesque apparatus when it comes to discussing aid statistics. Finally with this piece, Li does what he does best — take something that the North Koreans have been doing since their founding as a Republic in 1948, and spinning it as ‘reform’ or progress. The second link consists of yet more pics of PRC Ambassador Li’s May trip to the North Korean countryside and discussion of possible food aid. Most interestingly, it notes how busy Pyongyang was on 5 June, with large numbers of people getting geared up for work in the countryside. 朝鲜女子因何不敢嫁中国男人 | With a title like this — ‘Why North Korean women do not dare to marry Chinese men’ — this piece is possibly a bit explosive. It follows on other stories in Chinese news media that start to foreground and problematize the North Korean worker in China. As we saw with the incident in Tumen on 31 May, when North Korean women physically attacked a journalist on assignment for Le Monde, various arms of the PRC bureaucracy have differing views about how these workers should be handled, and to what extent they should deserve special leeway or treatment due to their national origin. In addition to asking the rather uncomfortable (and somewhat taboo) public question about the utter lack of personal freedom enjoyed by North Korean female workers in China, the article gives a bit of data about average wages. Naturally there have been other stories in Chinese rumbling around in the past several weeks that merit some analysis — such as China’s fighter-jet drills over Dandong and possibly Sinuiju, the connection of the Zhou Yongkang purge and trial to North Korea, the implication put out in Chinese media that Kim Jong-un has probably been invited to Beijing for the September 3 anti-fascist parade, or fantastic gumshoeing (within acceptable comradely limits, of course!) by the Xinhua bureau in Pyongyang with respect to shiny new apartment blocs which are rumoured to be without functioning lifts — but then again, perhaps that is what Twitter is for.